So far Tom Perry has created 89 blog entries. We have reviewed two core components of the Crewe Alexandra Football Club safeguarding policy: (i) the child protection and safeguarding policy and, (ii) the whistleblowing policy. We provide a third document showing the email exchanges needed to secure the policies from the club. The whistleblowing policy is key because in England there is no legislation that requires employees and/or volunteers who have responsibility for the care of children in a ‘Regulated Activity‘ (a football club academy for example) to report known or suspected abuse to the statutory authorities. Anyone who chooses to report is by default a whistleblower with little legal protection. Furthermore it’s discretionary to report a safeguarding concern. No law is broken by a member of staff who chooses to not report a concern to the local authority for independent assessment that perhaps, only many years later when the child has disclosed abuse in adulthood, secures a criminal conviction. Please read the conclusions on the first page of the safeguarding policy review below. To the extent safeguarding works in any setting, it does so thanks to good staff trying their best with a legislative framework that simply cannot function effectively within Regulated Activities. The design and delivery of any safeguarding policy is vitally important and reveals the extent to which safeguarding is embedded in the culture of the setting. In 2018 a representative of Mandate Now provided evidence to the Independent Football Review led by Clive Sheldon QC. The Chair of the National Safeguarding Panel @churchofengland attempting to sell a counterfeit suggestion that mandatory reporting exists within the Church. Meg Munn, the recently appointed Chair of the National Safeguarding Panel of the Church of England, appeared on Radio 4 Sunday programme on the 17th March 2019. The peg for her contribution was the appalling story of Bishop of Chester, one of the 26 Spiritual Lords who contribute to the formulation of legislation in the House, failing to report to the statutory authorities abuse perpetrated by Rev. Gordon Dickenson which Dickenson wrote to him about in 2009. Dickenson was convicted earlier this month of eight counts of sexual assault after pleading guilty to abusing a boy during the 1970s inside a church hall and even his vicarage. How much does Barnardo’s really care for vulnerable children? | Why did it sign an Independent Advocacy Contract with the Youth Justice Board at Medway in which it agreed to not refer child protection concerns to Local Authority? In 2013 the children’s charity Barnado’s entered into a contract with the Youth Justice Board to provide independent advocacy for children at the Medway Secure Training Centre in which the charity agreed not to refer any concerns about child protection to Kent local authority. What does this tell us of the charity’s commitment to vulnerable children? Just how safe are the children they are meant to be advocating for and protecting today? The LTA Chief Executive Scott Lloyd said on the 25/1/19: “the LTA has now undertaken a root and branch review of its safeguarding” and “is committed to having the best safeguarding procedures possible at every level of the game.” Our review of the LTA safeguarding reveals dysfunctional safeguarding has been retained despite Mr Lloyd’s assertions. Our review is available here. Little reliance can be placed on the County Association Safeguarding Template policy. In England, Wales and Scotland there is still no statutory obligation to report either known or suspected abuse to the Local Authority (or the police in appropriate circumstances) for independent assessment. LTA policy provides no commitment even to consult with external agencies, such as the local Authority Designated Officer (“LADO”) for advice and/or guidance, when a safeguarding concern arises. The LTA claims a child is a person under the age of 18 years. The proposed extension of the Position of Trust Law to sports coaches was put on hold by the Government many months ago. Here are the roles to which the law currently applies. Sports coaches are not included. The LTA policy is a Potemkin village. Like all safeguarding policies, its foundation is ‘statutory guidance’ issued by the Department for Education to assist Regulated Activities, such the LTA, deliver law effectively. But there is no law to report known or suspected child abuse. As a result the term ‘statutory guidance’ is little more than an oxymoron. The reality is, the head of an LTA affiliated tennis club/centre who has statutory responsibility for safeguarding cannot be held to account by safeguarding legislation for failures to refer known or suspected child abuse to the statutory agencies. Furthermore, absence of legislation means staff who make a report in good faith, have no protection against legal action if the report they make is not validated in law. The LTA is free to exceed the de minimis expectations of ‘statutory guidance’ to produce a safeguarding policy on which greater reliance can be placed. Unfortunately it has made no attempt to address the legislative vacuum in order to support staff and better protect young players in LTA care. What hope for culture change? 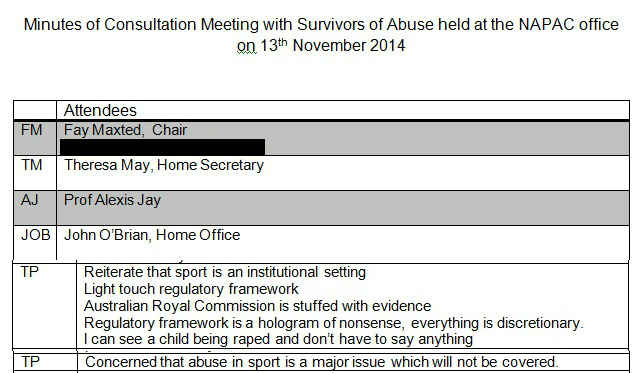 Mandate Now is a pressure group that since 2005 has led the agenda for the introduction of mandatory reporting of known and suspected abuse by those employed in Regulated Activities (schools, faith, sport, scouts, cadets, healthcare). Over 200,000 people signed the Mandate Now petition which called for the introduction of the law which exists in the majority of jurisdictions on all four continents. 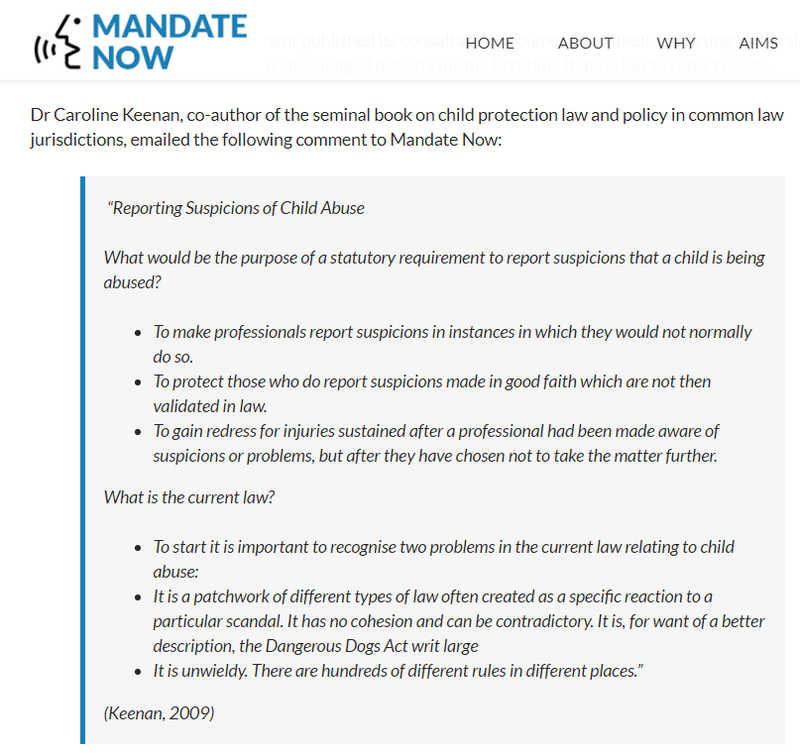 Mandate Now is a participant in the mandatory reporting seminars that help by the Independent Inquiry into Child Sexual Abuse. 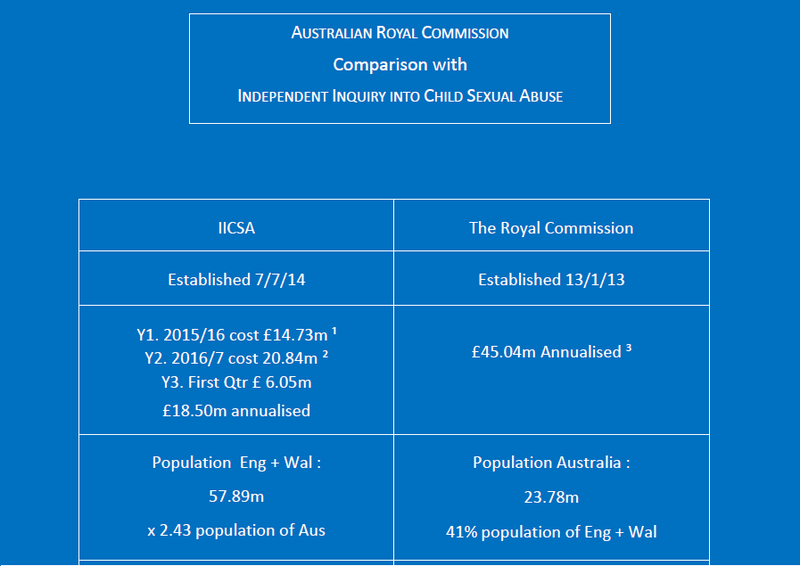 What impact is the striking difference in resources having on IICSA? A number of questions arise from the presentation given by Mr Graham Archer (Director of Children’s Social Care, Learning and Development – Department for Education) on the topic of ‘Existing Reporting Obligations in England and Wales’. 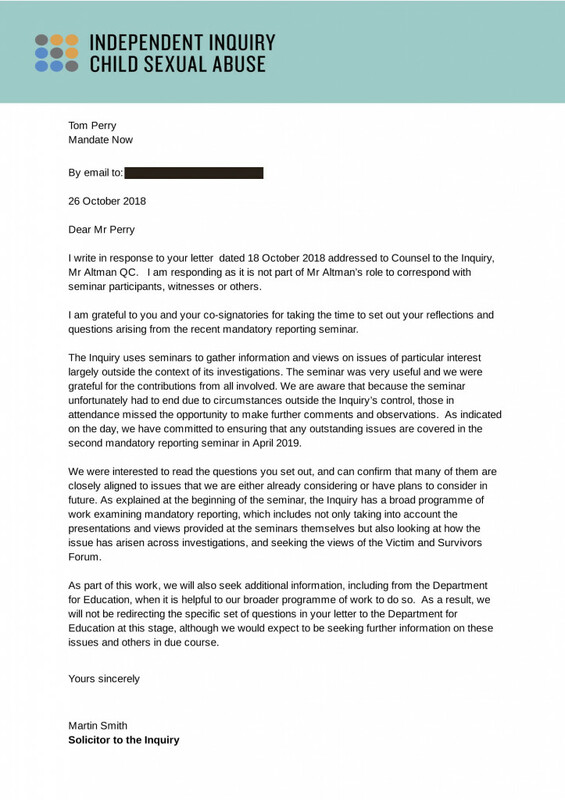 With delegates not being permitted to ask questions of each other, Mandate Now and other signatories have written to IICSA to seek answers about a number of the ‘obligations’ to which Mr Archer alluded. We hope the inquiry asks and receives answers to these matters well in advance of MR Seminar (2) scheduled for 30/4/18, and makes them publicly available. Mandate Now made two submissions to IICSA’s MR seminar which are available by following this link. By clicking on the YouTube link you will be taken to the start of Mr Archer’s presentation. On the 26th October IICSA sent the following reply to our letter. Of particular note is the fourth paragraph. 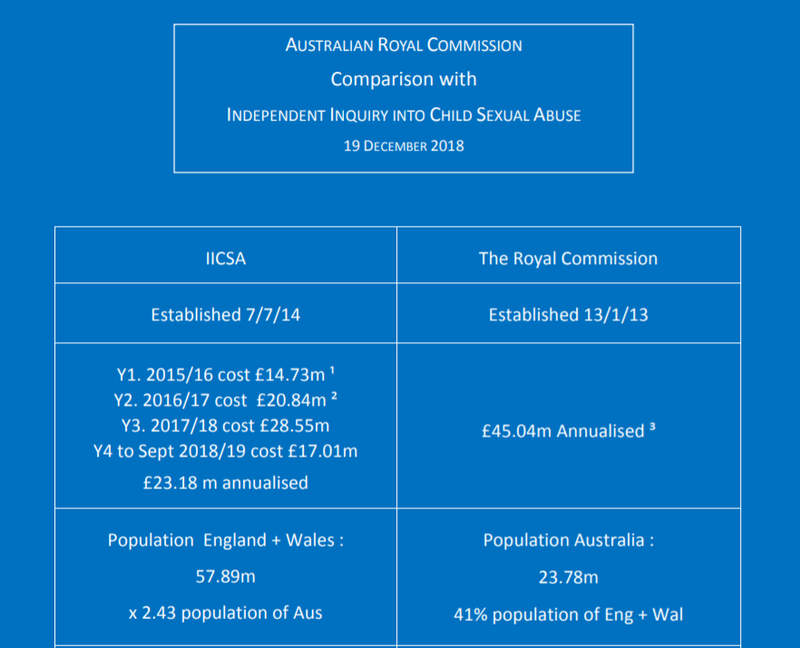 It’s unfortunate that none of our questions, with which IICSA are so closely aligned, were asked at the MR seminar after Mr Archer’s presentation. The outcome of this mischievous and poorly designed consultation is a triumph of dogma over reality. Mandatory reporting of known and suspected abuse of children by specified regulated activities is an essential component of functioning safeguarding framework. The majority of the rest of the world knows it. Here is our detailed review. The proposed action to be taken by government has ignored under-reporting of known and suspected abuse by Regulated Activities (such as schools), the very point of Amendment 43 tabled by Baroness Walmsley in the Serious Crimes Bill that secured the consultation, and instead concentrated on improvements to inter-agency services and communication once a referral has been received by the Local Authority. Our review explains why this will deliver little change, but that seems to be the intention. 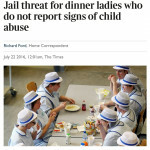 According to the pre-launch media briefings, dinner ladies and secretaries were going to be jailed for failing to report signs of abuse. It’s nonsense of course, as anyone familiar with Amendment 43 will understand, but it provides an insight to the irrational fear Government has of mandatory reporting of known and suspected child abuse, and here’s why. Government has ignored empirical evidence and data in order to arrive at a pre-determined outcome. As we provided in our submission, data from mandatory reporting jurisdictions reveals that mandatory reporting legislation introduced to Regulated Settings sees the number of referrals to the statutory agencies from mandated reporters’ double. In turn this leads to a near doubling in the number of children being placed into safety who would otherwise be left to their fate. The Government and those who reject the introduction of MR have to own and face up to the responsibility that they are knowingly leaving children to their uncertain fate who would otherwise be placed into safety with the introduction of mandatory reporting. Question to Lord Agnew – Parliamentary Under Secretary of State at the Department for Education from Baroness Walmsley.